Barah Durwazah [or Golden Mosque], Gaur. bl.uk > Online Gallery Home	> Online exhibitions	> Asia, Pacific and Africa Collections	> Barah Durwazah [or Golden Mosque], Gaur. 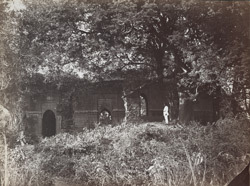 Photograph of the Barah Durwazah (or Golden Mosque) at Gaur taken by Thomas Fraser Peppé in 1870 as part of the collection of Sir Richard Carnac Temple. The mosque is comprised of eleven entrances, two buttresses, four corner towers and a spacious courtyard which is almost seventy metres in diameter. The building is faced in plain stone and the doors would originally have been framed by mosaics of glazed coloured tiles in floral patterns. Built in 1526 by Nusrat Shah it is the largest building still standing in Gaur.